Now, ya gotta admit this is cool stuff, because as my colleagues Raphael Bostic and Chris Redfearn point out, wacky things happen when the ratio between land value and structure value get too far off. Notably, you have land that could be far more intensively used, and it isn’t. Henry George gives us some insights as to how tax policy can reinforce these problems. 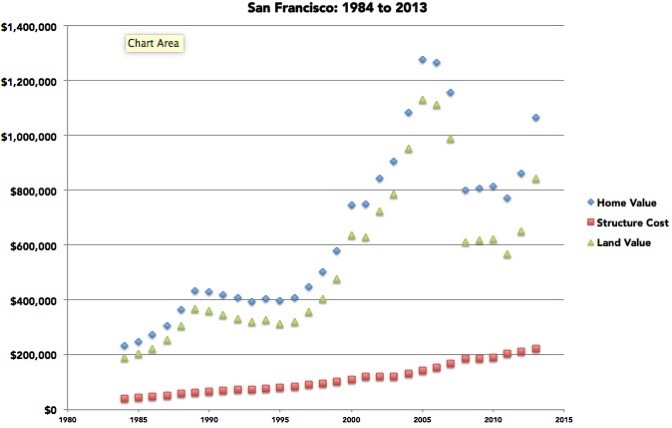 You can see that here in San Francisco in the lead up to the 2007 crisis. Bostic, Raphael W., Stanley D. Longhofer, and Christian L. Redfearn, “Land Leverage: Decomposing Home Price Dynamics,” Real Estate Economics 35 (2007), 183- 208.